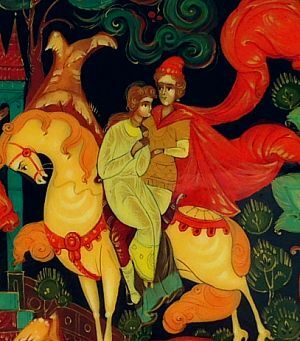 Swiftly rides Ivan Tsarevich through the night to show his father the trophy of his expedition: a glowing feather of the Firebird. After this first adventure, depicted on the top right corner, Ivan is to overcome many more challenges, including attempt on his life by his own brothers. 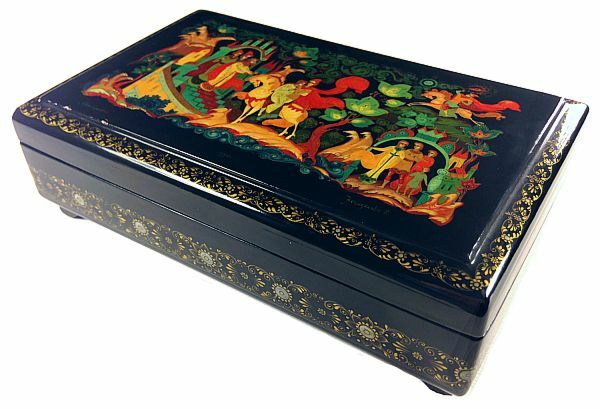 The famous Russian tale, which you can read here ___ plays out its full circle on this beautifully painted box. What stands out in particular is the artist's ability to convey the mood of the story without depicting all of its main elements. For example, while the two important characters - the wolf and the Firebird - are not painted here, their presence is felt throughout the work: the brown growth on the top and bottom left, under the horse in the middle, and around the bottom right corner, look like the wolf's claws. The presence of the Firebird is perceived not only from the image of its radiant feather clutched in Ivan's hand, but also through overall emerald theme present in the piece (her eyes are described as "eastern crystals" in the story). The colors used here - shades of deep ocean blue, bright coral, emerald green, and golden orange - also intensify the overall magic aura of this work. Every stroke in this piece seems to be done with careful deliberation. The box is made of high quality papier mache, stands on four legs, and has hinges at the top. The interior is red. There is a faint scratch on the bottom of the box, and a few small dents on the bottom and top of the lid. The rest of the box is in very good condition. The painting and sides of the box are decorated with an elaborate gold and silver ornament. The work is signed at the bottom with the name of the composition, year, and artist's name.